If you think of Detroit as a device, it’s the sum of more than its parts. Some of it is just naturally supercharged: a great location surrounded by fresh water, an international metropolis, sited right where the energy flows freely. A lot of it is in the brand: No matter how gritty it gets, it’s home to people who put their hands in the crankcase every day to make sure we get the highest performance. Some of it is pure aftermarket: the add-ons, mods, and downloads that help personalize all that power. And everything that makes it the best? That’s just what keeps you moving, whether your ride is all Mopar and muscle or a sleek, quiet, next-generation electric whip. It’s the powerhouse that makes it all go. It’s that arts scene that makes the wheels of your mind spin. It’s the music that keeps your head bobbing in the bars and clubs where the drinks provide another kind of fuel. It might be odds in your favor as you roll the dice at the casinos, or cheer for your home team downtown. Maybe it’s the gym or spa that keeps your motor toned and purring, or the culinary creations that keep it running. Heck, maybe you need a little pinch of additive to keep those gears from grinding — and you can find that here too. Basically, our Best of Detroit issue is a peek under the hood of the Motor City and the people, places, and products that keep it running full tilt. You voted, and we listened, and took the time to delve a little deeper into the details of what you put over the top. Maybe you’ll find something here you didn’t know about (or forgot about) to keep you all revved up. Best Bagel – New York Bagel Baking Co.
Best Late Night/24-Hour Restaurant – O.W.L. 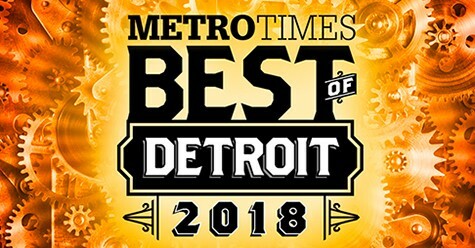 Best Bar (Ann Arbor/Ypsilanti) – Wolverine State Brewing Co.
Best Michigan Beer – Griffin Claw Brewing Co.
Best Michigan Brewer – Founders Brewing Co.
Best Michigan Vodka – Valentine Distilling Co.